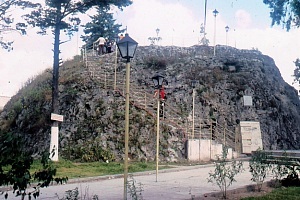 The Cuexcomate volcano, in a suburb of the city of Puebla, is generally considered to be the world’s smallest volcano. Weighing in at an estimated 40 metric tons, it stands just 13 meters (43 feet) tall, with a reach (diameter) of 23 meters (75 feet). The name Cuexcomate derives from the Nahuatl Cuexcomac which means bowl or place for keeping things. Mexico has thousands of volcanoes, and many very interesting ones, but Cuexcomate must surely be the only volcano in the country with a spiral staircase inside it! The volcano formed in 1664, as an offshoot parasitic cone during an eruption of a much larger volcano, Popocatépetl. Let’s hope that never happens. It would bring an end to one of the more unusual tourist attractions in this part of Mexico. Climbing down a spiral staircase into claustrophobic darkness is hardly an everyday experience for a tourist, or indeed for a vulcanologist. The crater is about eight meters across. Inside there is, frankly, not much to see apart from the inevitable lava! Cuexcomate volcano is located in a residential suburb of the city of Puebla, a city better known for its proximity to archaeological sites, colonial buildings and a massive Volkswagen factory. The world’s smallest active volcano is probably Mount Taal, located near the city of Tagaytay in the Philippines. It is a positively gargantuan 508 meters (1,660 feet) high, more than thirty-nine times the height of Cuexcomate, its Lilliputian cousin. 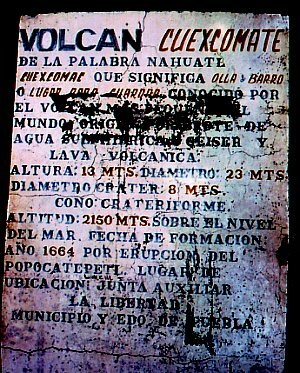 The headline is incorrect because Cuexcomate is the world’s smallest INACTIVE volcano, not the world’s smallest volcano. Thanks for your comment. Do you have a suggestion of a volcano that is smaller, whether active or not? Cuexcomate volcano is located in the residential suburb of La Libertad, at the junction of streets 3a Norte and 4a Poniente. Visitors to Puebla, a city that offers a complete range of tourist services, generally spend most of their time in the region’s archaeological sites, colonial buildings and stores. i am doing a school project on volcano’s and this is the coolest one i found. This sight is crazy full on info but one thing i want to add is u need what type of lava it creats! thanks ! i love this volcano its amazing only 43 ft tall that’s short but anyways i loved this project im doing for school and this is the one i found to be most interesting and factual so ya thanks .Oh and one more thing is you should add what type of lava it produces! Thank you for the helpful information, expanding on the topic would really help to ibform readers! I feel that this is just a brief glimpse of the volcano. Do you know that the world’s largest volcano is in Yellowstone? i am going to get married on Cuexcomate!!!!!!!!!!!!!!!! Congratulations! Please send us a photo! !